Continuing my review of this years Fine Art Exhibit at the State Fair. If you haven't checked it out yet, please take a look at part one. A reminder that you can click on any of the pictures to see them in a larger format. The first painting in this second installment is a brilliant piece by Minnetonka Artist Tom Foty. The painting is titled, "Study In Blues" and is a rendered in oil. Foty uses his strength as an illustrator to convey a wonderful charm in this work. The look on the face of the primary character is captured perfectly as are the expressions of the supporting cast. A viewers tendency might be an obvious comparison to Norman Rockwell's Saturday Evening Post covers and I'm not sure if that would bother Mr. Foty or not, but if it were me I'd take any such remarks as a compliment. Foty captures a whimsy and magic in this work that is as expressive as it is straightforward. I respect the honesty in this work as the artist doesn't try to be too clever, yet he's simultaneously immortalizing a moment in time. Foty lets the characters do the talking in this wonderfully expressive piece. 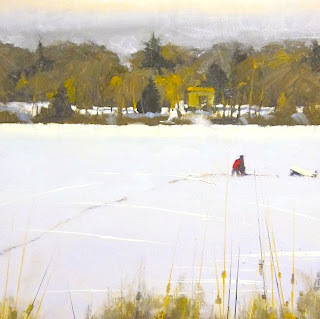 This is the work of well known Minneapolis painter Scott Lloyd Anderson. He's a disciple of the Paquet school (a student of the great painter Joe Paquet). Anderson is notable for his landscapes and I should mention that I have been following his work for almost a decade now. I follow Anderson for good reason, simply put, he's a great painter. Anderson's painting for the Fair this year is titled, "Gotta Move" and is a fantastic, colorful rendering. Anderson never fails to surprise me with his interpretations and this painting is no different. The large size and composition of this work fills the imagination and an entire wall. The fact that Anderson can convey a story in his work is not new, but what may surprise you are his thoughtful interpretations. The next painting is titled, "Turning Toward The Light" is by Saint Paul Artist Patricia Duncan. I found myself spending long moments just admiring Duncan's skillful use of color and value to bring this work to life. From the shadows on the side of the building to the gentle light on the sunflowers Duncan masterfully pulls things together and provides the painting with a wonderful vibrancy. This wonderful painting is titled, "The Shores Of Gitchee Gumee". The large, colorful and wonderfully interesting oil painting is by Excelsior Artist Mary Scrimgeour. Scrimgeor uses bold strokes and confident color choices to illustrate her story. The painting has great balance in its composition and it's easy to see why Scrimgeour was selected for the exhibition. The tall, open sky and the red ground work in harmony with the white teepee's pointing to the heavens. I don't know if it was intentional or not, but Scrimgeour's tribe may contain just ten little Indians. In any case, this is a wonderful illustration brought to life in an oil painting and one of my favorites of the show. 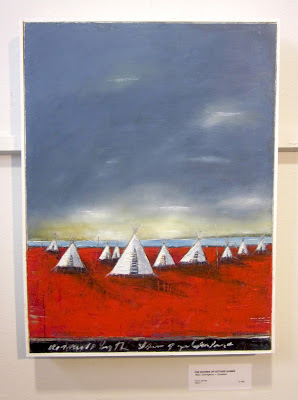 Don Biehn is a St. Paul Artist whose work I've long admired. He is a masterful painter whose skillful ability to bring life to a painting is something to be thoroughly enjoyed. Biehn's entry into the Fair highlights much of the skill he's known for. Biehn has the rare ability to extract the very essence of a scene with the smallest suggestions of line and color. I respect Biehn's paintings not just for their economy, but because they almost always manage to evoke a familiarity, a dormant memory or more. This painting by Biehn, titled, "Ice Angler" is fascinatingly simple, yet compelling. The lone fisherman sits isolated on the frozen lake, framed by either shore. His brushwork is confident and Biehn is smart enough and skilled enough not to overwork the canvas. Check back soon for Part III of the series.